Enjoy great multitasking performance in a small form factor board with the Intel® Desktop Board DH61DL. It is designed to run with the 2nd generation Intel® Core™ processor family in the LGA1155 socket. This mini-ITX board supports the latest features including USB 3.0, and dual display capabilities making it an excellent choice for an entry-level mini-ITX based system. This board offers premium features such as Intel® High Definition Audio (Intel® HD Audio) with 5.1 surround sound and multi-streaming capability and an integrated Intel® PRO 10/100/1000 Network Connection in a low-power design. 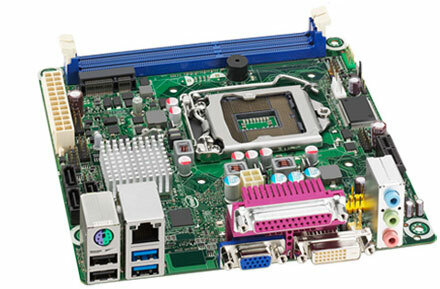 The Intel Desktop Board DH61DL is Microsoft Windows* 7 Ultimate and Windows Vista* Ultimate WHQL certified. Replacement for Atom D510MO Board in my car-pc. Used together with a Pentium G620T cpu. If you need more then 2 USB 2.0 ports you need to buy some for the internal USB connectors (3x).